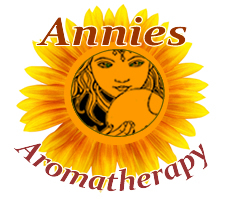 Constituents: salicylic acid, flavone glycosides, essential oils,tannins. 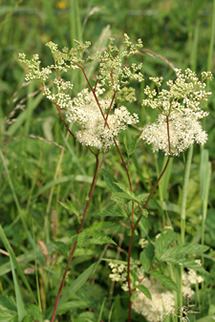 Preparation Methods & Dosage :Meadowsweet can be taken in teas, as an extract or in capsules. This sweetly scented flower commonly named "bridal wort" was popular in bridal bouquets, thought to bring love, joy, a beautiful wedding day, and a happy marriage. 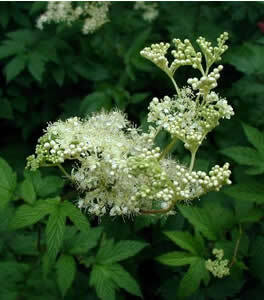 It was one of the three sacred herbs renowned by Druids, along with vervain and water-mint. Jupiter is the regent of the Meadow-Sweet. The flowers are alexipharmic and sudorific, likewise astringent, binding, and useful in fluxes of all sorts. Hoffmann, David (2010-12-15). Medical Herbalism: The Science and Practice of Herbal Medicine (p. 36). Healing Arts Press.